Talking on the reports of Central Vigilance Commission (CVC), which is investigating the scope of corruption in commonwealth games projects, the government today assured strict action against the accused. Disappointed at not getting the coveted Khel Ratna, ace Indian shooter Gagan Narang today took a dig at its selection criteria, saying the country's highest sporting honour seems to be decided more on the basis of public and media perception than the athletes' performance. Gaganjeet Bhullar rode on a blemish-free back nine to turn in a sensational six-under 65 to finish fourth in the Asian tour's Brunei Open golf tournament here today. However, compatriot Anirban Lahiri's fortunes tumbled as he signed off tied 14th after carding a one-over 72. Having witnessed Diego Maradona in front of them, the football-crazy people of Kolkata today saw another Diego, when 2010 World Cup golden ball winner Forlan left a 40,000-plus spectator spellbound in the floodlit Yuba Bharati Krirangan here today. With percussionist Sivamani setting up the tone with some lively performances, Forlan added colour to the evening as he kicked off the grand finale of 'The Match', a football reality show by Mahuaa Bangla. Young Indian Karma Pandya scored a big upset in the first round of Kavala International Open Chess tournament by defeating International Master Lela Jevakhshvili of Georgia, here. The memorable victory for Pandya against a much experienced opponent came rather quick and easy as the Indian went for the closed Ruy Lopez and kept his cards close to his chest for the major part of the game. Australian Mark Webber took back the Formula One championship lead from Lewis Hamilton on Sunday after snatching victory in a Hungarian Grand Prix that Red Bull team mate Sebastian Vettel had been favourite to win. McLaren's Hamilton retired with a suspected gearbox failure. James Anderson took ten wickets in a Test for the first time as England beat Pakistan by a crushing 354 runs in their series opener at Trent Bridge here today. Pakistan were dismissed for just 80 - their lowest Test total against England, replacing the 87 they made at Lord's back in 1954 - before lunch on the fourth day. Formula One can do without another new team and should make sure it retains the ones it already has, according to Mercedes team boss Ross Brawn. The governing International Automobile Federation (FIA) is currently weighing up applications for the 13th and final slot, assuming no teams fall by the wayside before 2011, with an announcement expected this month. India will soon get a list of its athletics players who will represent the country at the forthcoming Commonwealth Games. 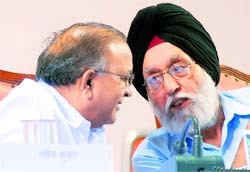 The All-India Senior Inter-State Athletics Championship is being organised at NIS, Patiala, from August 5 to 8 during which the final list of players will be declared. Around 600 athletes from all over the country will take part in this championship. It will include top players like discuss thrower Krishna Punia, Harwant Kaur and Seema Antil and shot put player Om Parkash. Somdev Devvarman is one step away from making the singles main draw of the ATP Legg Mason Tennis Classic after brushing aside Denis Kudla in the first round of the qualifiers. The fifth seed Indian beat the local wild card 6-1, 6-1 in the first round of the qualifying event. After an unprecedented five Indian tennis players competed at this year's Wimbledon men's doubles event, Rohan Bopanna says the day is not far when the country gets its first Grand Slam winner from the younger crop of players. Suspended IPL chief Lalit Modi today claimed that the BCCI disciplinary committee, probing his alleged irregularities, has demanded recusal of his lawyers representing him in the case. Till date it is Modi, who has been demanding recusal of Chirayu Amin and Arun Jaitley from the three-member committee. Modi, who has not appeared in person before the committee in the three hearings so far, made the claim on his twitter page and said he was shocked by the BCCI demand. “Just heard that BCCI want my lawyers to recuse themselves! Shocked since meeting was for committee’s recusal,” Modi wrote on his twitter page. Talking on the reports of Central Vigilance Commission (CVC), which is investigating the scope of corruption in commonwealth games projects, the government today assured strict action against the accused. The Union Urban Development minister S Jaipal Reddy, while inaugurating the newly built weight lifting auditorium for the games, said that “anyone found guilty will not be spared”. He said the Commission has just initiated the process and this is preliminary remarks. “We will seriously look into the matter. We would not spare anyone involved in the matter. I promise that action would be taken against if anyone found accused,” said Reddy. The Commission is looking into the alleged irregularities in the construction of the commonwealth games. It has come out with a report highlighting extensive corruption in the construction of Games stadiums. The CVC report says that almost all organisations executing construction work for the Games have disobeyed the rules while floating tenders of the projects, which had led to increase in their prices. The commission has also alleged that contractors have been paid more what they were supposed to be. The minister blamed media for the exaggerating facts and thereby creating a problem for the organizers. “I am open to criticism. It gives a chance to correct the problem. But the media should not only highlight the negative. It is exaggerating the problems, which is not the real case. Identify the shortcomings and tell us where we are wrong so that we can rectify them on time but please let’s not misrepresent the bigger picture,” said Reddy. “Media should instead help in building festive in the country for the games,” said the minister. He said that the games can be held only if there is a positive environment, and a celebratory mood. People of the country should feel excited, Reddy said. However, the preparations for the games have been shockingly lax with little over two months left before athletes from 71 nations come to India. On this, Reddy reiterated the fact that we are all ready to host successful games. “We would host wonderful games that would be remembered by all. They are going to be better than the Melbourne games,” said the minister. In a move to defend the clean image of the Organising Committee (OC), it’s Chairman Suresh Kalmadi today came out with letters of communication that the OC had with the Indian High Commission in London as evidence. He has denied the allegation of the Commission that it had not recommended the London based firm to the OC. The OC had transferred 247,000 pounds to AM Films for its services given during the Queen’s Baton Relay in October 2009. The British authorities are suspecting financial irregularities in the payments made by the OC and are investigating the matter. Kalmadi said that the Indian High Commission had itself recommended AM Films and its sister company for hiring cars and putting up mobile screens and toilets in London for the event. He has produced the letters written to the Indian High Commission and the replies sent to him by Raju Sebastian from the Commission. “The OC would like to clarify that we had written to Vikrant Ratan, the first secretary (Protocol) of the Indian High Commission to provide us the list of agencies of the Transport, accommodation and other services and their approved rates,” said Kalmadi. “In response, Raju Sebastian of the Protocol Division of the High Commission, giving reference to our mail to the First Secretary, Vikrant Rattan, informed that the approved vendors for the transport are AM cars and van and the chauffer company,” he said. “This clearly indicates that the Indian High Commission had recommended M/S AM Car and Vans to the Organising Committee for the Queen's Baton Rally function in London,” he added. PTI adds: Rejecting media criticism of the Commonwealth Games' preparations, Union Sports Minister M S Gill today asserted that there are no faults in the newly-built stadiums for the October 3-14 event. Gill said media has been wrongly criticising the preparations of the Games despite the fact that CPWD engineers and concerned officials are working round the clock to complete the work. “There are no serious flaws in the design of any of the stadiums. No faults in any of the roofs. The fact remains these stadiums have no faults and leakages anywhere. Don't underplay the magnitude of the big occasion. This is a legacy, live it,” Gill said inaugurating the Weightlifting auditorium inside the Jawahar Lal Nehru Complex for the October 3-14 Games here. “All responsible officers of the Public Works Department would be present at the venues all the time till the start of the Games. For next two months they will recheck deficiencies. So there is no question of unpreparedness,” Gill said. The world number two Narang yesterday became the first Indian to qualify for 2012 London Olympics after shooting a bronze in the 10 metre air rifle event in the 50th World Championship in Munich. “I am very very disappointed over what happened to me. It was third time in a row. I think, Khel Ratna is just inclusion of the public perception and media perception. It was disheartening to know that I was in run for my achievement in 2009, I was in with a chance in 2008 also. But I would rather like my guns to talk and hope that the bronze medal opens up a few blind folds,” Narang told NDTV. In the final round in Munich, Narang held his nerves to shoot a score of 102 which helped him bag bronze in a strong field of 128 shooters. The Indian lamented that even the world record could not fetch him the country's top sports award. Overnight tied 11th, Bhullar sank in as many as seven birdies, which included a birdie hat-trick on his back nine, against a lone bogey to finish with an aggregate of 14-under 270. The Kapurthala-lad picked up a stroke on the second hole but a bogey on the fifth pulled him back before he made amends with a birdie on the sixth to make the turn one-under. On resumption, Bhullar went on a birdie spree as he picked up a shot on the 12th and then hit back-to-back birdies from the 14th to 16th holes before ending the day with another birdie on the last hole. On the other hand, a double bogey on the last hole cooked Lahiri's goose. The Kolkata golfer started off well with a couple of birdies but bogeys on the fourth and seventh holes brought him back to square one. He then picked up a shot to make the turn one-under. However, his back nine proved to be a disappointing experience as he dropped bogeys on the 10th, 16th and a double bogey on the 18th hole against two birdies on the 12th and 13th holes to tumble down the leaderboard with a total of nine-under 275. After arriving in the stadium around 5.30pm, Forlan kicked off the match between Mohun Bagan XI and Challengers XI, a team groomed and coached by Branco in his 20-odd days stay here. Challengers lost the 70-minute match 0-2 but they stole the hearts of the thousands of football lovers gathered to see Forlan who sat in the dug-out giving tips, sharing his experiences with the Challengers led by Dipyendu Biswas. Australian Mark Webber took back the Formula One championship lead from Lewis Hamilton on Sunday after snatching victory in a Hungarian Grand Prix that Red Bull team mate Sebastian Vettel had been favourite to win. McLaren's Hamilton retired with a suspected gearbox failure, only his second blank this season, and dropped to second place overall, four points adrift. Vettel, starting on pole position for the seventh time in 12 races but again failing to convert the advantage, fell foul of the safety car rules and finished third behind Ferrari’s Fernando Alonso. Webber now has 161 points to Hamilton's 157, with Vettel on 151 and McLaren's world champion Jenson Button on 147. In one of the closest battles in years, Alonso has 141. Hamilton pulled over on lap 24, saying there was something wrong with the car. McLaren had expressed concern about his car's brakes before the start but his retirement appeared to be unrelated to that. Webber, celebrating his fourth win of the campaign, did everything right after going against the flow and staying out when the other frontrunners pitted for fresh tyres when the safety car was deployed on the 15th of 70 laps. His hopes were handed a massive boost when the stewards then slapped a drive-through penalty on Vettel for a safety car infringement, which dropped him behind double world champion Alonso. While Vettel cruised through the pitlane shaking his fists in the air with obvious rage at the officials, the Australian streaked away to build up a sufficient advantage to pit and retain the lead. Button had a miserable start and languished in 14th place until the safety car deployment, due to debris on the track, triggered chaos in the pitlane and allowed him to get into the points. The Briton, who had pitted before the safety car, finished eighth - and lapped. Mercedes's Nico Rosberg was released from his stop with a loose wheel that then bounced high among the mechanics as cars were coming in. They had been set a fourth innings target of 435 for victory that would have been a new world record had they acheived it. But they got nowhere near, with swing specialist Anderson taking six wickets for 17 runs in 15 overs, including five wickets for 10 runs in 45 balls today, to add to his first innings five for 54. That gave Anderson, who turned 28 on Friday, his best match haul of 11 for 71 in his 49-Test career, beating the nine for 98 he took against New Zealand on this ground two years ago. Danish Kaneria (16 not out) and opener Imran Farhat (15) were the only Pakistan batsmen to make double-figure scores in the innings. 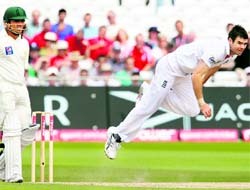 Bowling: Anderson 15-8-17-6; Broad 8-2-23-2; Finn 6-3-28-2. Those putting themselves forward include a partnership between Canada's former world champion Jacques Villeneuve and Italy’s Durango. Brawn, who won multiple championships with Ferrari as technical director before taking both crowns with Mercedes' predecessors Brawn GP last year, said any new team would struggle to get a car together in time. “I’d suggest it's getting pretty tight now,” he told reporters at the Hungarian Grand Prix. “We’ve started our car for next year. Obviously the amount of effort and resource we put in is front line. I think teams can get cars together in shorter periods, some of the teams have demonstrated that, but it's very difficult. So it looks pretty marginal to me to get a team together in time for next year,” the Briton added. The players are delighted and beaming with energy with just few days left to prove their mettle and most of them have reached the city to get familiar with the environment so that they could keep their best foot forward. Krishna Punia, who was recently chosen for the Arjuna Award, said she was delighted that her effort was being acknowledged. “The Games are my top priority and the preparations are going good. Things seem to be falling in place. The players are fit and seem to be on a high. 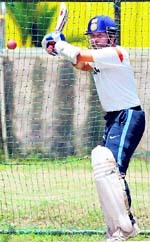 We are hoping to perform much better than previous Games and make a mark,” she added.